We’ve been waiting almost a year to find the time to get back to Kenomee Canyon. Last time we had two nights to travel the Kenomee Canyon loop and do some off-trail exploring, but we didn’t capture enough photos to make it worthy of a blog post. The loop is part of the Kenomee Trail System, located within the Economy River Wilderness Area. The trails are managed by the Kenomee Trail Society. They are located about 1hr40min from Halifax, with a variety of trails and two parking lots located off the River Philip Road. This trip came about because we were planning to attend a trail build event in the area on Saturday, so we decided to drive up early on Friday for a quick overnight. 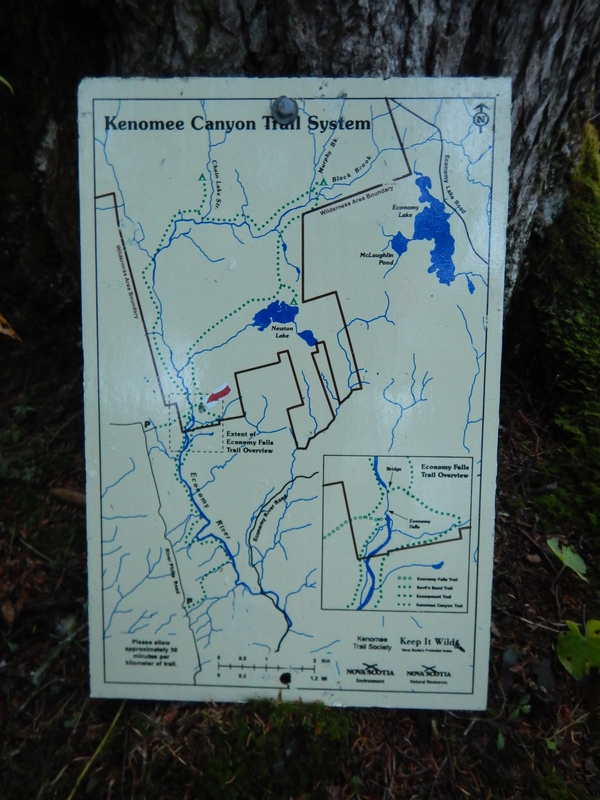 We were planning to hike the Kenomee Canyon trail loop in a clockwise direction and camp somewhere in the Newton Lake area. This would leave us a fairly short walk back to the car in the morning. There are at least 4 significant river crossings (wide and often fast-flowing) which can be impassible at certain times of the year. We weren’t expecting them to be too high on this trip, though there had been one recent heavy rainfall. Last November we crossed at the limit of our comfort level, with cold water flowing over the knees in places. The forecast for this trip was for significant rain overnight, but the skies were clear when we set out. The trail is well marked and relatively easy to follow. Aside from a few fairly recently downed trees, the trail is in good shape. It was mostly dry underfoot. There are numerous small water course crossings, but we could easily step over them. The entire tree was covered! There are beautiful hardwood stands along the route. The pictures show that we decided to wear orange on this trip. Although rifle season is not yet open, archery and muzzleloader hunting for deer is now allowed so we decided to be on the safe side. On this trip we encountered a lot of flagging tape (it was concentrated on sharp turns, but in many places it was tied right to the existing trail makers). We wondered whether this was related to upcoming trail maintenance, but later learned that this was not placed by anyone associated with the trail. Flagging tape, particularly when it is unnecessary, definitely detracts from the wilderness experience, and we’ve since heard that more than a few people have been led astray in this area. We were mindful of the impending rain in the forecast, so didn’t detour to visit the waterfalls this time. The three waterfalls spread out along the route are a big part of the draw to the trail. We were pleased to see how low the water was when we reached the first major crossing. We decided to cross in bare feet to keep our shoes dry, though it wasn’t much above ankle deep. We took off our shoes again to cross Murphy Brook, and after that we were able to keep our shoes on and feet dry. We made it to the Newton Lake area with lots of daylight. We filtered some water from the lake and then found a nice spot for the tent on fallen leaves in a hardwood stand off the trail. The timing worked perfectly – we set up camp and found a nice spot just up the hill for supper at dusk. The sprinkles started just as we were finishing eating. The heavy rain held off until we were tucked into the tent, though once it started, it rained heavily for much of the night. There was no wind though and we stayed nice and dry. By morning the gentle gusts were blowing the remaining water off the leaves but the rain had passed. We decided to skip cooking the oatmeal we’d brought and and instead munched on some snacks as we headed for the car. We had great views of the sun coming up over Newton Lake. There was one fairly wet and muddy patch of trail but we didn’t get too wet, and were able to keep our shoes on and feet dry over the last river crossing, which was a nice bonus. Soon we were back to the bridge which crosses the Economy River just above the main falls. And shortly after this point we were back at the car and ready to head off to the trail build. We enjoy this trail and look forward to getting back. Hopefully one of these days we will have time to explore all of the waterfalls along with the Devil’s Bend portion of the trail and more of the surrounding Economy River Wilderness Area.